Take I-94 south to I-294 south. Take the Willow Road exit toward Prospect Hts/ Wheeling. Willow becomes Palatine Road. Continue west to Elmhurst Road (Rt. 83) and turn left (south). Turn left (east) on Central Road. Turn right (south) at the next block on Emerson Street. Parking garage is south of the Library on the right. Take I-294 north. Exit Dempster Street west. Turn immediately right onto Rand Road (Rt. 12). Take Rand Road north to Central Road. Turn left (west). Turn left (south) on Emerson Street. Parking garage is south of the Library on the right. Take I-290/53 north. Exit Higgins/Golf Road. Take Golf Road (Rt. 58) east to Elmhurst Road (Rt. 83). Turn left (north). Turn right (east) at Central Road. Turn right (south) at the next block on Emerson Street. Parking garage is south of the Library on the right. To reach the Library’s parking lot from the street level, cars must enter through the Village parking deck next to the Library. The entrance to the parking deck is located at the southern most driveway – it is clearly marked ENTER with a sign on Emerson Street. 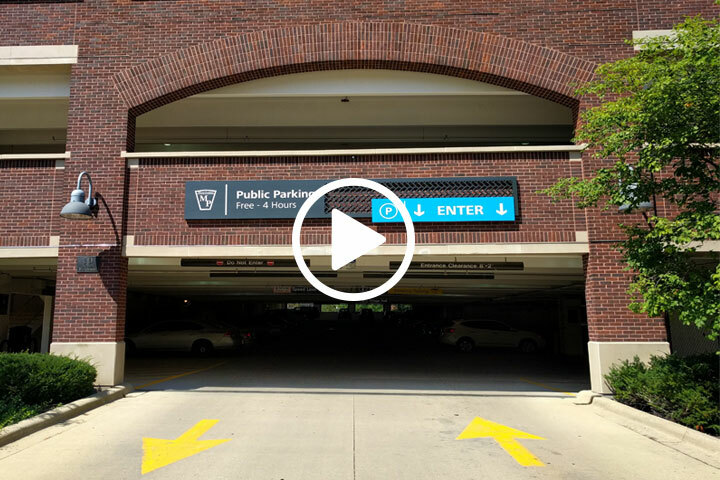 Once inside the parking deck make an immediate right and then a quick left turn to access the downward sloping ramp – continue to follow the ramp down, turning left several times until you are underneath the Library. Follow the signs.Our lower lobby is located on the eastern side of the parking lot. There is an elevator and stairway to the main Emerson lobby. Handicap parking spaces are located directly north of the lower lobby doors. To view our Parking Policy, click here.